Should you find a cheaper like for like Internet price for TopShape Worktops, we will beat it! TopShape from Top Form is a unique, flexible and innovative worktop, combining high quality materials and vibrant colours to create cutting edge designs. Featuring a contemporary square-edge and shaped profile, TopShape will revolutionize your kitchen and bathroom designs. Whether you wish to revamp or update your existing worktop solution, increase your work surface area, or create a new contemporary kitchen or bathroom, TopShape from Top Form is the creative solution for you. 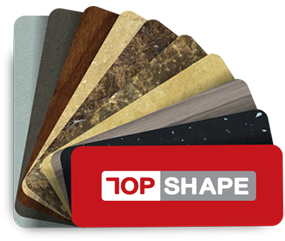 TopShape from Top Form worktops are edged on all four sides and laminated both top and bottom with the same high quality laminate. Installation is quick and easy and does not require any on site finishing, this guarantees a seamless finish every time. 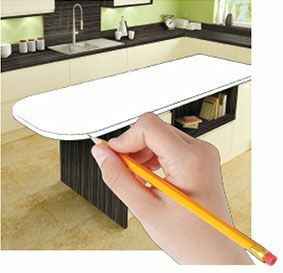 This contemporary square edged profile top will revolutionize your kitchen designs. If you are looking for something out of the ordinary, our TopShape Custom Programme is the answer. It allows you to simply design your very own unique kitchen, with short lead times and to a reasonable budget. The programme is an easy-to-follow four-step process – simply sketch the shape you require with dimensions and we’ll do the rest. TopShape allows you to create sweeping curves with a minimum 30mm external and 70mm internal radii. Individual pieces can be custom made up to 3600mm x 1200mm. Once your order has been placed, please allow two to three weeks for the manufacture process.